Space epics seem like the next big wave in comic book movies. The success of Guardians of the Galaxy and the now space-bound Thor (not to mention Star Wars) have given studios to green light more interstellar adaptations. Captain Marvel is up next, then more Guardians of the Galaxy and now there's news of Green Lantern Corps, The New Gods and The Eternals in the planning stages. 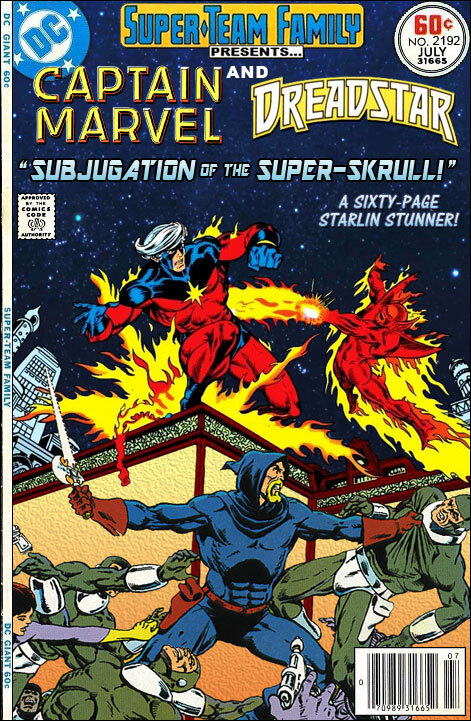 How long before Dreadstar gets his chance? I wonder if Dreadstar's shipmate, Willow, will ever get to meet Willow Rosenberg and Willow of the planet Andowyne? Seeing Dreadstar in a film would be great, if only to give Starlin some proportionate income from all the other concepts of his they're making money from! Wow! That’s from Captain Marvel #27, the first Marvel comic I ever read. I had no idea what was going on in the story, but I loved Jim Starlin’s art so much that I was hooked. Mar-Vell and Vanth are practically brothers. What if Thanos captured the Infinity Horn? Looking back now, I see some close similarities between Dreadstar and Co. and the current movie GOTG, as far as the motley, rag-tag crews go. Just sayin'. Dreadstar has actually been optioned for TV. I believe it is the same company that just optioned Warren Ellis' Injection for TV. I loved Dreadstar back in the day. How about Star-Slayer and Capt. UK vs. X-O Manowar? I'm not familiar with Dreadstar, but I take it he and Oliver Queen get their beards trimmed by the same barber? Other Spaced out teams I'd like to see get a cinematic debut include Alien Legion, Sun-Runners and Omega Men.